From the New York Times bestselling author of Garden Spells comes a story of the Waverley family, in a novel as sparkling as the first dusting of frost on new-fallen leaves..
Claire Waverley has started a successful new venture, Waverley’s Candies. Though her handcrafted confections — rose to recall lost love, lavender to promote happiness and lemon verbena to soothe throats and minds — are singularly effective, the business of selling them is costing her the everyday joys of her family, and her belief in her own precious gifts. Sydney Waverley, too, is losing her balance. With each passing day she longs more for a baby — a namesake for her wonderful Henry. Yet the longer she tries, the more her desire becomes an unquenchable thirst, stealing the pleasure out of the life she already has. Sydney’s daughter, Bay, has lost her heart to the boy she knows it belongs to.. if only he could see it, too. But how can he, when he is so far outside her grasp that he appears to her as little more than a puff of smoke? Whimsical & magical-2 words that come to mind whenever I read a novel by Sarah Addison Allen. I first discovered Allen’s books about 7 years ago and have loved them ever since. I’m a HUGE fan of magical realism! First Frost is the sequel to Garden Spells, a book where readers are first introduced to the Waverly’s and their unique, magical qualities. Claire can change feeling and emotion with a taste of her food or candy, Sydney can take a hair-do and change someone’s day, and Bay, Sydney’s daughter, knows exactly where people and things should belong. As the Waverly ladies approach First Frost, things start to get out of whack. It isn’t until the beautiful apple tree starts blossoming will things be set straight again. With elements of magic, love, and the value of family, First Frost is sure to delight. SAA has this writing quality that is just beautiful, with it’s deeply descriptive detail and sense of magic that I love. IOne of my favorites: “It looked like the world was covered in a cobbler crust of brown sugar and cinnamon.” This novel was an enjoyable read that I didn’t want to end! I would love another sequel that tells the story of grown-up Bay! Do Dandelion Wishes Actually Come True? Katherine Galloway knew this moment of calm wouldn’t last, blown away like the dandelion seeds she scattered as a girl. 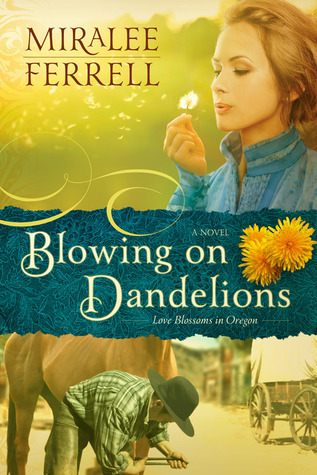 In 1880, three years after her husband’s death, she struggles to run an Oregon boardinghouse and raise two girls alone. Things don’t get easier when her critical, domineering mother moves in. Katherine must make the situation work, but standing up for herself and her family while honoring her mother isn’t easy. And with a daughter entering the teenage years, the pressure on Katherine becomes close to overwhelming. Then she crosses paths with Micah Jacobs, a widower who could reignite her heart, but she fears a relationship with him might send things over the edge. She must find the strength, wisdom, hope, and faith to remake her life, for everything is about to change. I really enjoyed this book. I went into it thinking it was going to be an “old timey western” and I don’t read western books…but it was simply a book set in the late 1800s that highlighted a widow who is headstrong, confident, loving and kind, and her journey towards a new found love. The characters were very imaginable and realistic. I could sense how genuinely kind and beautiful Katherine was, how cute and innocent her Mandy was, and the pure bitterness that emanated from Katherine’s mother, Frances. I found myself siding with Lucy most of the time and wanted Katherine to finally just stand up to her mother’s rude remarks! But Katherine, ever the Christian, loving daughter, always held her tongue. When Micah Jacobs loses his farm in a fire, as well as injures himself, after losing his wife 2 years prior, he begrudgingly stays at Katherine’s boardinghouse. Amongst misunderstandings, tempers, and blossoming relationships, Katherine, Frances, and Micah discover the meaning of love and family, as well as the redeeming grace of Christ. I received this book via Netgalley. All opinions are my own.